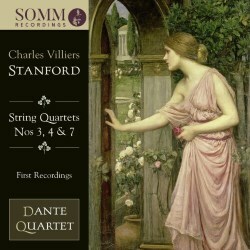 This is the most welcome second album of Sir Charles Villiers Stanford’s String Quartets on the Somm label, the first containing the 5th and 8th Quartets I reviewed in 2016 (review). We are treated here to accounts of the 3rd, 4th and 7th Quartets which are all first recordings, now on Somm’s Céleste series. These are such excellent works that I still can’t eradicate the feeling of frustration that it has taken so long for first recordings of such marvellous works to appear, as most were written over a century ago. A renowned composition teacher at Royal College of Music, Stanford could boast a substantial roster of successful pupils. Stanford’s scores are seldom associated with the field of chamber music, although his output in that area includes an impressive total of eight string quartets between the years of 1891-1919; half were published, and the other half remained in manuscript, a factor which clearly didn’t help their circulation. Stanford clearly took the responsibility of writing for the genre very seriously, as he was aged almost forty before commencing work on his String Quartet No. 1, although he had by this time composed half a dozen chamber works for a variety of instrumental combinations. A major stimulus for Stanford to compose his first five string quartets was the influence of the legendary Hungarian virtuoso violinist and composer Joseph Joachim (1831-1907). It could be said that Joachim had been a personal mentor to the young Stanford, just as Mendelssohn had been to the young Joachim. Stanford undoubtedly gained considerable inspiration from the playing of Joachim’s distinguished Quartet, founded in 1869, which performed throughout Europe for almost four decades. Consistently throughout Stanford’s string quartets I cannot escape hearing the considerable influence of the Austro/German tradition, notably Mendelssohnian charm, optimism and variety combined with Schubertian poetry and rich lyricism. Given Stanford’s propensity for lighter textures, I experience less of Brahms’ emotional expressiveness, dark colouration and intensity. However, I can detect the influence of Bohemian master Dvořák, whom Stanford knew well and had between 1884 and 1896 made nine visits to England. Stanford composed his String Quartets Nos. 1 and 2 in 1891 but it was five years before he began writing No. 3 whilst he was holidaying in Milan, completing the work back in London. The score bears the dedication “to my friends the Joachim Quartet” who gave the first performance at St. James’ Hall, London in 1898. With his friend Joseph Joachim in mind, he wrote the score to be especially challenging for the leader. It’s the opening movement Allegro moderato ma appassionato that makes the greatest impression, with its Mendelssohnian lightness and good humour together with an undertow of unease. Stanford dedicated his String Quartet No. 4 from 1906 “to my friend Johann Kruse”. Violinist Kruse was a member of the Joachim Quartet who went on to lead his own quartet. In 1907, Kruse, together with Haydn Inwards, Lionel Tertis and Herbert Withers, premièred the score at the Cambridge Musical Society. In view of Kruse’s ability, Stanford again intentionally designed a difficult part for the leader. Standing out is the Finale marked Allegro molto vivace containing the vivacious feeling of an Irish folk-dance; yet amid all the exuberance one senses an anxiety and an inability to settle. In the manner of a lament, the Adagio contains a deep melancholy which might easily depict the pain of parting from a loved one. Believed by Jeremey Dibble to have been written in “late 1918 or very early 1919”, the String Quartet No. 7 was introduced in 1919 at Royal College of Music by a student quartet. It was fifty-five years later before the quartet received its second performance, given by Alberni Quartet at the Savile Club, London in 1974 to mark the fiftieth anniversary of Stanford’s death. Of the four movements, conspicuous is the Andante, which contains a vein of pain weaving through the melancholy while a galloping character dominates the Scherzo which has a welcoming, almost festive atmosphere. Wholehearted proponents of this lovely material, the Dante Quartet is notably committed and displays considerable artistry in these Stanford scores, coping unwaveringly with their technical demands. In first performances that feel rather safe, I am at times left wanting additional tonal shading and broader dynamics. Biographer Jeremy Dibble has written a model booklet essay which is both interesting and informative, containing plenty of technical detail for those who require it. The recording was made at the Church of St Nicholas, Thames Ditton; the sound engineers provide pleasing clarity and balance, although for my taste the instruments are lacking in some richness. Chamber music lovers looking for works outside the standard repertoire should be delighted with these three engaging Stanford string quartets receiving their first recordings.